Do you, or someone you know suffer from headaches? 1 out of 6 Americans suffer from headaches and over 8 million people a year ago to go to their primary doctor with the main complaint of headaches. And would you believe me if I told you that for the most part headaches are an unnecessary suffering? You’re probably saying but Doc I have headaches that everyone else has are they common? They may be common but they’re not normal. You may be thinking that you don’t have a headache that often. I might agree with you if you had a headache maybe once maybe twice a year. But if you’re having a headache every month, or every week, or let’s say you’re having just two headaches a week, do you realize that’s over 100 headaches a year! That is NOT normal, that your body’s way of giving you an alarm that something is wrong and needs to be considered correctly. And if you’re taking medication on a regular basis, think about the potential side effects and adverse reactions that medication could be causing to your health developing secondary health problems. Here’s another question, how are they affecting your life besides the pain? I’ve had patients tell me their job is on the line because their work performance is poor or that their relationships at home are an absolute mess. There have even been patients who have told me, doc, the headaches are so bad… I just want to take a bottle of pills and end it all. My name is Dr. Jon Heyer, I am a Holistic Chiropractor, Acupuncturist and Nutritionist and in my office, Holistic Health and Chiropractic of Frankfort we use a three-prong approach, a holistic approach, to helping people suffering from headaches. There are three sides to a person’s health (show triad of health). Research is showing that 60 to 70% of all headaches have a cervicogenic origin. That’s frontal headaches, sinus headaches, occipital headaches, migraine, even cluster headaches; all major types of headaches have their origin in the neck. Maybe that sounds frustrating to you because you’ve gone to your medical doctor and not gotten satisfactory answers about what’s causing your headaches or even worse; fewer solutions. And maybe they did an x-ray, CT or MRI of your head; I’m not telling you they did anything wrong I’m just saying they may have missed the spot by a couple of inches and needed to look below your head into your neck. The vertebrae in your should have normal range of motion, they should be able to bend left right forward backward and rotate and have good play in between the joints, well unfortunately, some people have vertebrae or joints that are stuck are fixated we may commonly call it and out of misalignment, chiropractors would call it a subluxation. This subluxation can cause nerve interference which then causes the pain. To remedy this problem, we make a specific correction restoring the proper motion in the joint and by removing that nerve interference and allowing the body to heal itself. There may be some people who have been to chiropractors before and not gotten the relief they are looking for. Please, let me share with you, that not all chiropractors do things the same way and no two are exactly alike. Many times, the source of the problem is more complex than just the neck and we need to look at the patient’s whole posture. In this picture, you’ll see three upside down triangles; the big one at the bottom represents the pelvis or foundation of the spine, the second one in the middle is the trunk of the body and the third is the head sitting on the neck. You’ll see the jaw as a right side up triangle and swings like a pendulum. You can see that when everything is properly aligned then everything is balanced. If there are imbalances from the pelvis up, or even the torso, it will create distortions in the posture and spine that manifest in the head, neck and jaw and can be the cause of the pain. 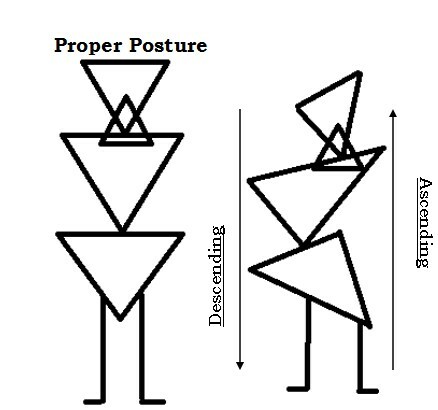 So often postural subluxations are overlooked but when corrected the problem resolves. Acupuncture is excellent for helping address tension and migraine headaches which are the two most common types of headaches. But how does it work? Somewhere behind a wall are wires, going from the light switch to the light in the room. You can’t see the wires and you can’t see the electricity flowing through the wires but you can see the result; the light that illuminates the room. Your brain and your nervous system are very similar. Your brain is like a giant battery which sends electric signals down the nerves to the body. So, if you want to do a bicep curl to lift a weight or wiggle your fingers and play the piano, your brain sends an electric signal, down a nerve, to the muscles to coordinate movement in your arm or hand. Your nerves are just like an electric wire, sending electric signals. Even though you can’t see your own nerves or the wires in the wall, you know they are there and you can see the end result. Any electrician can tell you if a wire is hot and live by using a voltmeter because if there is an electric current running through the wire, there’s a magnetic field around the wire. Regarding the nerve, we have many names for this magnetic field; some may call it an aura, a meridian, a channel or what have you. I don’t really care what you call it but there’s a flow of energy through the body that brings balance and homeostasis to the whole. If there’s a blockage or excess or any kind of interference in that distribution of energy, symptoms can manifest and in many cases… headaches. We use a type of acupuncture called electro-acupuncture to rebalance any disturbances or interferences to restore homeostasis. Or, let me put it a different way, your cell phone works best on a full charge compared to when the battery is almost dead…. So, does your body. We charge up your system to function better. There can be many causes and contributing factors from a nutritional perspective that can cause headaches. Food can be a cause. I know what you are saying, “but Doc, I had a food allergy test and they found nothing.” Ok, but did they do a food sensitivity test? Do you know the difference? Probably not, but most doctors don’t either. Did they test your mineral and vitamin levels? “But doc, what’s that got to do with headaches?” Many cases of headache sufferers have a deficiency in magnesium. But how would you know if you weren’t properly tested? Would you believe that gut issues, digestive issues and microbiome imbalances could be the primary problem with headaches as a secondary symptom but the one that screams the loudest??? Maybe you feel like you’ve tried everything. Maybe you have, at least everything that contemporary medicine considers. Yet you have no answers and worse, still have headaches. That’s why we need to look at your nutrition from a functional perspective and you… from a Holistic approach to helping you end headaches for good.